I consider it the role of the head of a newspaper to be bi-partisan and to bring journalists together with people from government. . . . I fear unspoken anger. Especially, people who may disagree on politics must still be able to communicate, and it's crucial for all of us in the press to listen to all sides. Katherine Graham, Personal History, p. 610. "And that, ladies and gentlemen, is why we are gathered here tonight." With that statement, the audience explodes in applause, and the speaker steps back from the lectern for a moment and beams. It is the rousing conclusion to a crafted piece of oratory. The speaker and audience seem as one - but wait a minute. There in the back row, one person turns to another and says, "Nice words, but what the heck was he saying?" Unfortunately, this little back-row interrogatory happens all too often. We like the speaker. We like the words. We even like the response from the audience, but when we step back metaphorically, as the speaker does physically, we are left with an empty feeling. Why is this? How can this be? Everyone liked the presentation. There's a simple reason: There was no message to the speech. The speaker certainly had his style and his purpose for being clear, but there was a disconnect between the speaker and the audience. Why? The purpose of the leadership message was unclear. Unfortunately, this situation occurs all too often, both on the public stage and on the corporate stage - or, frankly, even in the church basement during a fundraising planning session. The same thing occurs in one-on-one meetings. For example, the boss calls you into his office. He starts talking about the business. He asks you how you are doing, but before you can respond, he's off talking about other people in the department. He eventually focuses on you and asks how things are going for you. As you begin to speak, the phone rings. He answers it, then holds up his hand and says, "Hey, nice of you to drop by. Could we continue this conversation next week?" You mumble something as you walk out of the office shaking your head. What was that little talk all about? Just as the speaker in the introductory vignette was unclear about his message, the boss was unclear about his. Leaders cannot afford to be unclear; clarity of purpose extends to communications. If the leader cannot express a coherent point of view, the department, the team, and individuals are left adrift in a sea of uncertainty. As hard as we work on who we are and why we are there, we sometimes forget the "What is my message?" part. The purpose of leadership communications, as pointed out in Chapter 1, is to build (or establish) trust between leader and follower. This trust is essential to a leader's credibility. Lyndon Johnson lost the trust of the American people over his conduct of the Vietnam War. His accomplishments in civil rights legislation and the war on poverty were overshadowed by his refusal to be straight with the American people, or even with himself, over the issues involved in Vietnam. The accounting firm Arthur Andersen suffered an enormous lack of credibility in the wake of its faulty auditing. Its lack of accountability (no pun intended) destroyed the company and cast a harsh light on other major accounting firms that were beset with their own scandals. The financial markets, too, reverberated as investors wondered if they could trust the financial statements of any company. Speak the truth. Tell people what the facts are. Be straight with people. The "open book" management style (where employees are free to look at management finances and policies) works because it shares information across all levels. The approach fosters a greater sense of responsibility. Zingerman's, a thriving community of food-related businesses in Ann Arbor, Michigan, employs the open book style with great success. As a result, Zingerman's owners have created a sense of shared ownership as well as an esprit de corps for the entire enterprise. Don't hide bad news. We live in an era of transparency: People want to see inside an organization. With the multiplicity of information channels that are available, bad news always becomes known, so it behooves management to be candid right from the start. Winston Churchill did not shirk from telling the British people how dire the odds were in May 1940 as Britain stood alone against the Nazi war machine. And there was no wide-scale panic. People are capable of accepting the truth if you are honest with them. Never overpromise. Do not make promises that you cannot keep. Politicians seem never to learn this lesson. Campaign promises are not promises at all; they are platitudes. As a result, politicians as a group have little credibility. That said, there are individual political leaders in both major parties - Franklin Roosevelt and Harry Truman among the Democrats and Theodore Roosevelt and Ronald Reagan among the Republicans, for example - who have a great deal of credibility. Why? Because they were seen to deliver on their promises. Do what you say you will do. Tell people what you are going to do, and then do it. Tom Brady became the starting quarterback for the New England Patriots when the starter was injured. To everyone's surprise, he led his team to a series of victories that landed the team in the Super Bowl. Brady, a second-year man, never gave the rah-rah speech; he let his actions on and off the field do the talking for him. He was focused and clear in his signal calling in the huddle and supportive on the sidelines. Off the field, he was disciplined in his workouts and in his comments to the media. He simply said he would do his best, and he did. The message is the most important part of the presentation or the one-to-one chat. It is the core upon which the entire presentation or conversation depends. Think of the message as the 30-second "take-away thought" that you want people to remember. The message is not the same as the content of the presentation or conversation; it is the reason for the speaking. If you will indulge a simple analogy, consider the presentation or conversation as a piece of chocolate candy. The content is the chocolate surrounding the creamy center. The creamy center (or the cherry, if you prefer) is the message - the heart of what you are saying. What are you trying to do? Why are you speaking to this group or this individual? Do you wish to explain a hot topic? Do you need to sell them on a new process? Do you wish to impart a need for change? Or do you just want them to have some laughs? Each of these purposes is valid. Your challenge as a leader is to decide what you want to do, and do it. If you work for an organization of any size, you quickly become accustomed to presentations. Politicians make them. Celebrities make them. Entertainers make their living off them. The most successful leaders are those whose message you can sum up quickly in a sentence or so. We know where we are headed and why. We are an organization that puts people first. We must change the way we do business. That sentiment is the beginning of the message. It is not the message itself; rather, it is the flavor of the message. Returning to our chocolate analogy, it is the difference between raspberry and orange fillings, or between strawberry and vanilla. All of these fillings may be creamy, but the flavor varies. As a rule of thumb, the more precise and concise you are about your message, the more precise and concise your presentation will be. Inform people of what the issues are and what they need to do. Leaders owe their people an explanation of the situation, whether the news is good or bad. Good examples of leaders who kept their people informed are Jack Welch of General Electric and Rich Teerlink of Harley-Davidson; both of these CEOs let people know what was going on in the business as well as attending and participating in events where stakeholders and other people voiced their ideas. Both men also spent time listening to customers, which meant that they were personally informed about issues, and that when it came time to communicate internally, they did so from a credible platform of knowledge. Also keep in mind that even when there is no news, leaders need to be seen and heard frequently. Absence in this case does not make the heart grow fonder, it gives rise to gossip. Involve others by soliciting their input. Herb Kelleher, founder of Southwest Airlines, was a master of getting other people involved. By traveling around on his airline, he met and mingled with employees at all levels of the organization, from executives to ticket agents and baggage handlers. His openness shattered the imaginary barrier between boss and employee, and in so doing invited people to raise issues and offer suggestions. Add to this the fact that Southwest Airlines is employee owned, and you have a successful model for involvement because employees have a stake in the enterprise. Ignite people's imaginations about what they can do to make things better for themselves and their organizations. Imagination is a powerful mental tool. Consider the example of Mohandas Gandhi in the independence movement in India. Gandhi's words and example, coupled with the charisma that sprang from his commitment and simplicity, rallied a nation to think about the possibility of becoming independent from Britain. While many thousands of leaders in every region of the subcontinent made separation possible, it was Gandhi who lit the flame and stoked it by words and example. Invite people to participate in the enterprise, whether it be the fulfillment of a goal or the transformation of a culture. Leaders who talk about what people can do for themselves and by themselves are leaders who understand their role as inspiring action or change. Joe Torre never batted, fielded, or pitched for his Yankee championship teams, yet he was the one who invited superstars and other players to play together as a team in order to win. His invitation made players of all abilities feel that they could contribute, and as a result, they did. Other successful coaches do the same thing, and in the process create win-win situations: a win on the scoreboard and a win for the collective psyche of the team. All four elements need not be apparent in every message. Sometimes the leader's message is simply an update. Other times it's a call to action or an invitation to do something. But over the course of a leader's tenure, the success of leadership communications depends upon including these four elements over and over again. When a leader informs his or her people, involves others in the effort, ignites ideas about what is to be done, and invites people to participate in the process, that leader gains support for his or her ideas and makes the process of achieving results possible. Also, as with all strong leadership messages, the leader makes it possible to build greater levels of trust, the bond upon which all leadership must be grounded. 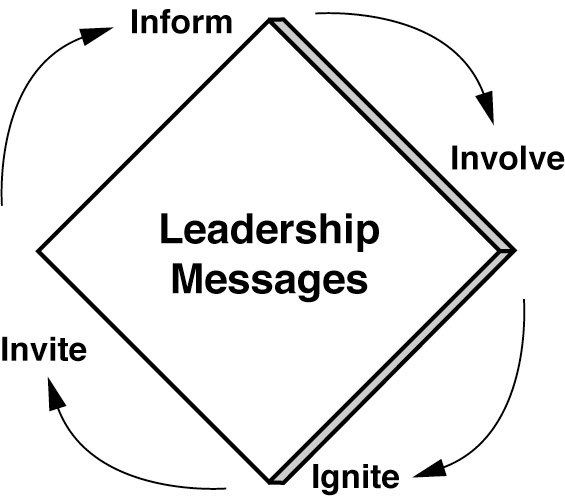 When we think about leadership communications, we often assume a downward flow of messages from the leader along with a bubbling up of messages from an engaged audience or individual. This communications loop from leader to followers and back again is not the whole story. Leaders also need to communicate upward. The recipient of such messages may be the leader's boss, a company director, or sometimes an advisory committee. These messages, like other forms of leadership communications, are grounded in the culture of the organization and are about significant issues related to vision, mission, and transformation. Likewise the purpose of upward leadership communications is the same: to build trust and drive results. Keep everyone on the same page. People deserve to know what is going on. Leaders at the top often feel isolated from what is happening at the grassroots level, either with customers or with front-line employees, because they are shielded from it, either by layers of bureaucracy or by sheer negligence. The leader who keeps the boss informed is keeping the boss in the loop. Separate facts from passion. Facts are neutral; they tell what happened. Opinions color. When giving information, leaders owe it to themselves and to their listeners to keep their convictions separate from the facts. Let the facts speak for themselves. Good leaders know when to express a point of view and when to let the facts stand. Sell when necessary. Leaders have a point of view; it is part of their position of authority. When they believe something strongly, they will try to persuade others. It is perfectly acceptable, on most occasions, to share a point of view. But when expressing this point of view, frame it as such. In this way, the boss receiving the message will know what's fact and what's opinion. Read the signs. Keep the antennae up. Listen to what senior leadership is saying, or not saying. Often what is not said or expressed is as important as the words. Leaders who are communicating upward need to know how both the leader at the top and the leaders in the middle feel about the issues. Such knowledge allows the leader who is communicating upward to know how she or he must shape the message. Upward leadership communications serve another purpose: They create a culture of dialogue and discussion. When employees see their bosses communicating regularly with their own managers, they soon learn that communications is integral to the leadership process. And while individual requests may not be granted or goals be met, the process of communications never ceases. Credibility is the bond between leader and follower; it is almost sacred because it forms the bedrock of why people want to do what leaders ask them to do. Sometimes a loss of credibility occurs because the leader makes a mistake. Think of leaders who fail to fulfill their promises. Other times circumstances conspire against the leader and, through no fault of his or her own, problems arise. Think of economic slumps. None of us is perfect, even leaders. 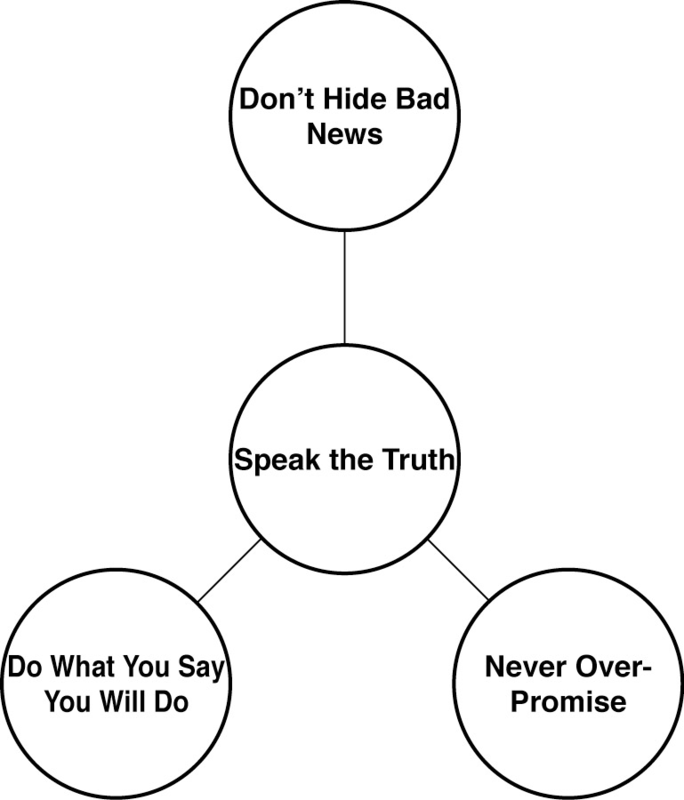 If a leader's credibility becomes damaged, what can the leader do (see Figure 3-3)? Acknowledge the mistakes. When decisions do not turn out the way they were intended to, the leader owes his or her followers an explanation. Bill Clinton lied to the American people in the Lewinsky affair and turned an indiscretion into a political quagmire that harmed his presidency. When he finally did acknowledge his misdeeds, it was too late. His credibility was destroyed, and while he had nearly two more years in office, his presidency will always remain one of potential rather than achievement. By contrast, Jack Welch acknowledged that news of his lucrative postretirement perquisites was hurting G.E., so he stepped to the fore and voluntarily surrendered those perquisites rather than risk besmirching his former employer. Apologize. Admit that what you did was wrong and say you are sorry. It may be painful for the moment, but it can shorten the agony and enable the leader to put the incident behind her or him. During the war in Afghanistan, our military was involved in several incidents that harmed civilians and friendly forces. Our military commanders acknowledged the mistakes and apologized immediately. Credibility between the wronged parties and the U.S. government was maintained. Make amends. Find ways to make it up to the people you have wronged. Make restitution to those you have harmed. [8 ]For example, if a company is found to have cooked the books, the perpetrators need to be punished. If those actions resulted in a loss of pension funds for employees, the company should find ways to make restitution. This is not simply courtesy, it is a way of repaying loyalty and ensuring its continuance. The point must be made that the leader may not be the person who was directly responsible for misdeeds. As the leader of an organization, however, he or she owes it to the stakeholders to take responsibility and be accountable when things go wrong. Leaders who step forward and accept blame will often rise in stature, not decline. Why? Because they are seen as people who are trustworthy. Credibility, remember, is like currency; followers decide how much of it they want to buy, sell, or hold. The greater the holdings, the greater the levels of trust. The leadership message is the most important part of the presentation. It is the core upon which the entire presentation depends. Think of the message as the 30-second takeaway that you want the audience to remember. Here are some questions that you can use to spark your thinking process. The answers to these questions will help you formulate your message. Why am I speaking, and what do I want to say? How can I establish credibility? What do I want people to remember? How can I sum up my message in less than 30 seconds? How will the audience react to my message? How can I color my message to improve its clarity? If I make a mistake, what steps can I take to restore my credibility as leader? When you read Katherine Graham's autobiography, you get the feeling that this is a woman who was not certain of her selfhood until very late in life. Make no mistake: Katherine Graham was a giant who took a not very good newspaper and built into one of the nation's most respected, and at the same time created a media empire. Along the way, she helped bring a president to justice, stood down a tough union, and survived a husband who demeaned her as he sank deeper into a suicidal depression. Underneath her society-bred manners and sweet exterior, Katherine Graham was one tough broad. As publisher of the most influential paper in the world's most influential capital, she was a powerful communicator and a shining example of how to learn to lead. At every step in her public career, the stakes got higher. And each time she rose to the challenge. When Graham took over the Washington Post in the wake of her husband's suicide in 1963, it was not the powerful institution it would become. It was dowdy, parochial, and, except for its being in the nation's capital, inconsequential. In a way it was a mirror of Graham's self-assessment of her abilities. Although she had been a reporter in her twenties, she certainly was no businessperson. She took the helm out of family duty; her father, Eugene Meyer, had owned the paper, and Graham wanted to keep it in the family. Despite her role as publisher and owner of the Washington Post Company, Graham was very much a creature of her upbringing. She did as she was taught; she deferred to men: first her father, then her husband, and later the male executives in her own company. She illustrates her naivet� in quotes taken from a Women's Wear Daily profile of her written in 1969, in which she admits, "I guess it's a man's world. . . . [M]en are more able than women at executive work and in certain situations. I think a man would be better at this job I'm in than a woman." In her autobiography, Graham attributes her success as a publisher and as a businesswoman to men. She extols Ben Bradlee, the crusading editor who stood behind reporters Bob Woodward and Carl Bernstein during the Watergate investigation. She also credits his journalistic integrity for helping to make the Post a great newspaper. Graham is warmly laudatory of financier Warren Buffett, who after buying a stake in the Washington Post Company became a sort of financial mentor, helping her to learn the business side of publishing. Graham's learning process stemmed in part from her ability to listen. She was comfortable with asking questions and integrating lessons into her actions. Complementing her listening was her writing ability, often expressed in letters. For example, she speaks of the letters she and Bradlee exchanged annually; it was their own private feedback on each other's performance. Such letters are a good way to air issues, settle accounts, and give due acknowledgement for success. Graham's views are not that remarkable. As one of the few high-profile businesswomen of her era, she had no female role models or peers. She was literally a pioneer in her field. What she demonstrated was her willingness to learn from others. She was not threatened by the presence of brilliant people. In fact, she relished their company. And the lessons she learned helped to give her the confidence she needed to become the leader she was capable of becoming. The sum of her collected learnings can be found in her autobiography, Personal History, which subsequently won the Pulitzer Prize. Inside her company, she also could be tough. Right after Watergate she went toe-to-toe with the pressmen's union, which was resisting modernization efforts. To her the Washington Post was family, and the strike was very painful for her. When rogue elements in the union vandalized the presses, she took it as a personal affront, and it stiffened her resolve. After more than 4 months, during some of which time she was personally vilified by members of the union, the strike was settled. She learned also that "when management . . . forfeits its right to manage, only trouble can result." She resolved to improve "communications within the company. "[12 ]With the labor issues settled, the company prospered. In 1991, when she handed the reins of the company to her son, Donald, the company's revenues had grown from $84 million to $1.4 billion. She had the final say on editorial and publishing decisions. In 1971, when her paper, along with the New York Times, published the Pentagon Papers (government documents about the United States' involvement in Vietnam that were leaked to the public by Daniel Ellsberg), it was her name that was on the injunction brought by the Nixon administration. It was a risky decision, not just because she was going against the administration, but because it coincided with the Washington Post Company's going public. Publicity of this sort would not be helpful. Graham persevered. She quotes Bradlee as saying that it marked a "graduation of the Post into the highest ranks" of news organizations. Graham's will would be tested a short time later during the Watergate investigation. From the moment of the burglary at the Watergate complex on June 17, 1972, to President Richard Nixon's resignation on August 9, 1973, it was the Washington Post that led on the story, keeping it alive after Nixon's landslide election in November 1972, when few other papers had any interest. Bradlee, as executive editor, was front and center on the coverage, but Graham supported him. It was important to her. Watergate "was a conspiracy not of greed but of arrogance and fear by men who came to equate their own political well-being with the nation's very survival and security." This is an apt statement about Watergate, and also about any other political scandal in Washington or any other capital. The credibility of the press stood the test of time against the credibility of those who spent so much time self-righteously denying their own wrongdoing and assaulting us by assailing our performance and our motives. Not a bad epitaph for a woman who grew in her role as a leader and used her communications to demonstrate leadership in good times and bad, and in the process served as a good example for others. Learn from others. Never be afraid to learn from those you respect. Graham assumed the helm of the Washington Post knowing little of business but something about journalism. She surrounded herself with strong leaders and learned from their example. Make a stand. Abide by your principles. During the painful strike at the Washington Post, Graham stood down the powerful printers' union and won. It was a painful victory, but it opened the door to a greater future. Be honest. Let people know how you feel about the issues. Graham's autobiography is such a powerful story because she is candid about her shortcomings as she emerged into a leadership role. Believe in your people. Support the people you work with. Graham stood by her editor, Ben Bradlee, and her team of reporters through thick and thin. Live your message. After the death of her husband, Graham's life was the Washington Post. She lived, breathed, and fought for the paper and the journalistic ideals it stood for. James Lardner, "Why Should Anyone Believe You?" Business 2.0, March 2002, pp. 42-48. This article provides background material on the issue of credibility. Four-step model inspired from points in Nick Morgan, "How Effective Leaders Communicate," Harvard Management Communications Letter, September 2002, Synopsizing four points of a communications model (empathize, engage, educate, enlist) from James Wanless, Intuition @ Work & at Home and at Play. Michael Useem, Leading Up: How to Lead Your Boss so You Both Win, pp. 74-114. Andy Raskin, "Free Advice for the Suddenly Non-Credible," Business 2.0, March 2002, p. 48. This article provides background material on the issue of reestablishing credibility. Paula J. Caproni, The Practical Coach: Management Skills for Everyday Life , pp. 71-73. Katherine Graham, Personal History, p. 418. Obituary of Katherine Graham, The Economist, July 21, 2001. Graham, Personal History, pp. 441-459.